Farm Works™ Mapping combines all the elements of former Farm Works programs Trac, Site and Pro, in an easy to use software that provides both basic and advanced layering functions and also gives you the ability to maintain a complete system for field record keeping. And Mapping is a great price! For $750 you get what would have cost $1150 (when you purchased Trac, Site and Pro). for a comprehensive management solution for your farm or operation. Lorra Note: For those who own only Farm Works Trac and also have a current Update Service Plan, an update will give you the Mapping software (which includes all the features of prior programs Trac, Site & Pro!). The Update Service Plan for Mapping will then cost $300/year. For Trac owners who do not have a current Upate Service Plan, the cost to upgrade will be $300 plus a transition fee of $100. Enables you to set up clients, farms, fields and crop-year enterprises. Enter crop plans for ordering product, budgeting, equipment usage, and employee allocation. Scale ticket feature allows you to calculate dry yield. 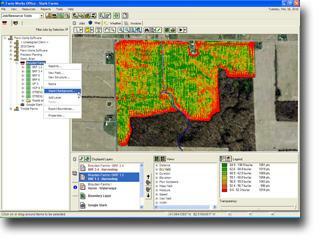 Use Bing™ maps to draw field boundaries or display as background maps. You may also use Google™ maps to draw field boundaries or display as background maps. Create then edit and manage guidance paths from Trimble guidance systems and all Trimble® field displays.